Monkey Show and Training Center Tour in Pattaya Beach. Monkey Show and Training Center Tour in Pattaya Beach - Thailand. Book Online. Welcome to the Pattaya Monkey Training Centre, otherwise known as Monkey University. The monkeys in here are excellent workers and reknowned for their coconut harvesting skills on the plantations of the south. The monkeys start their training at 1 year of age. Only males are selected and the course takes 12 months to complete. They are then ready to go to work. In the past the farmers trained the monkeys themselves, few still do. 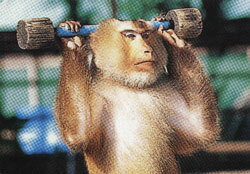 Nowadays most farmers buy pre-trained monkeys from a training centre such as Monkey U. Here at Monkey U. they've taken the training a step further and you'll be amazed at what the star of the show "Superman" can do. Priced at 500 Baht per person. Includes transport and entrance fee.